Music. It makes the world go round. It’s the voice of a culture that echoes for generations. It can encapsulate a moment in a way we could only dream of articulating. Subtle riffs to make our worries go away, and heavy timpani to get us fired up. For me, music is as primal as food and water. Like cooking, music draws from a myriad of sources for inspiration. It is an avenue for the voices of suppression, and it is a lion rejoicing in a victory. Anything can inspire, be it a python satchel or the writing on the wall. For me, more often than not, I find my inspiration in a bass line. Whether the music guides me to the dish, or the dish dictates the music, the two are symbiotic. Currently suffering through a dry spell as far as live music is concerned, I’ve had to get creative to fill the void. Whether I’m crooning to the Stones between bites of Shepard’s pie or it’s meatballs with a side of Sinatra, it helps alleviate the pain. Nothing quite beats a session at Red Rocks under the stars, but it proves distracting. My day gig entails hours of mandated presence in front of a dimly lit computer screen. At times this leads to an existential crisis, and at others it leaves me to sift through the lineup of yet another musical event from which I’ll be excluded. In recent times, this means I’ve been perusing the endless list of performers at Austin, Texas’ annual South by South West(SXSW) Festival. I’ve never been to Austin and I’ve never been to Texas. For a while, I only knew Texans as a breed that would descend upon the slopes of Colorado in springtime like locusts. Donning ten gallon hats, ski poles tucked towards the sky, and emitting a broken record of “Yips” and “Yee-haws” while careening at high speeds down the mountain, I wasn’t quite sure what to make of them. I’ve come to learn a good bit about the city of Austin, and my curiosity has been sparked. It’s the birthplace of my one true love, Whole Foods (an amazing gourmet/organic food market), and a city slogan is “Keep Austin Weird.” It supposedly has a thriving music scene, and a laid-back ambiance to rival that of Boulder. Also lying in close proximity to our neighbors to the South, I can only assume the city has a healthy presence of Tex-Mex culinary delights. 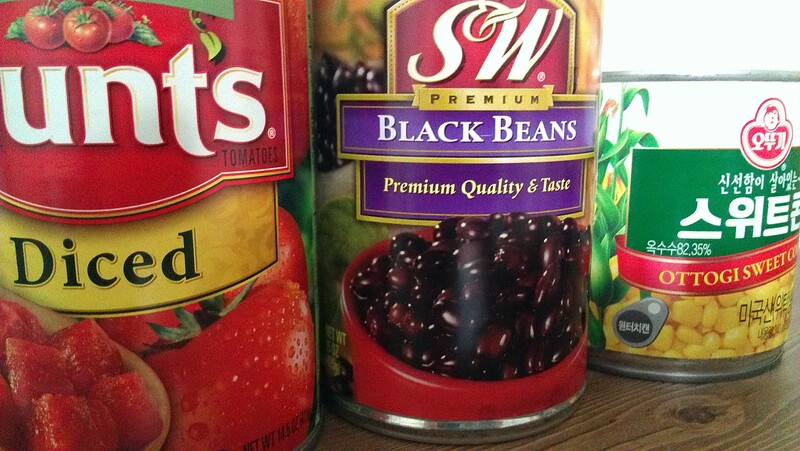 With all this, I was left inspired, still in Korea, and with cans of black beans and sweet corn at my disposal. 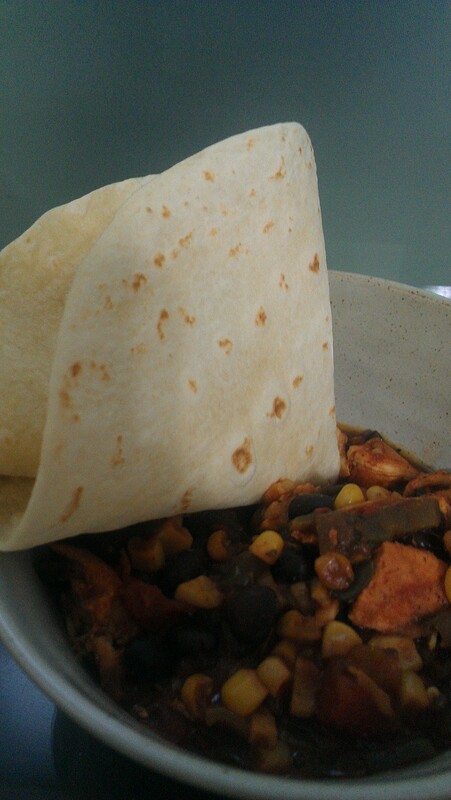 What I came up with is a taco/fajita filling of sorts. It struck all the right chords when paired with a flour tortilla and some streaming Grace Potter. The dish is given a Korean flair by the addition of Korean chiles, fire roasted over a tiny apartment hot-plate. Not to worry, the propane essence dissipates in the finished dish and they add just the right amount of kick. If you can stand it, I think this dish was even better the next day, but either way it’s an easy one-pot meal. 1. 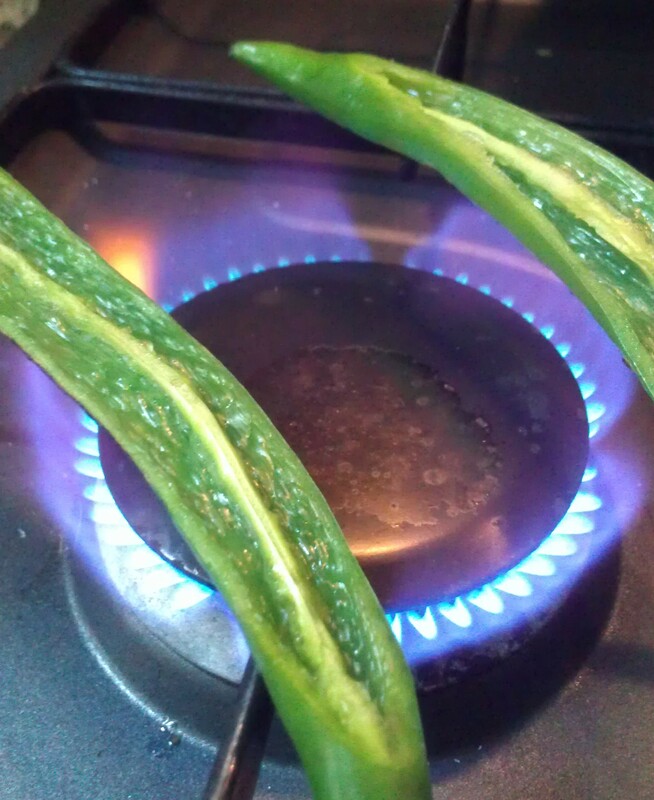 To roast the chiles, I like to first cut off the stem and slice down the center to devein. I find this method easier than leaving all the cleaning to the end. Next, over a medium-high flame on a gas range, roast the chiles skin-side down until the skins have become almost entirely black. Remove the chile from the flame and transfer immediately to a paper or plastic bag. Twist the bag closed to allow the steam to loosen the skins. When the chiles have cooled, easily scrape off the charred skins with your fingers. Dice the chiles and set aside. 2. Heat oil in a large pan over medium-high heat. Season chicken liberally with salt and pepper, then transfer to the hot pan. Brown the chicken and set aside. 3. 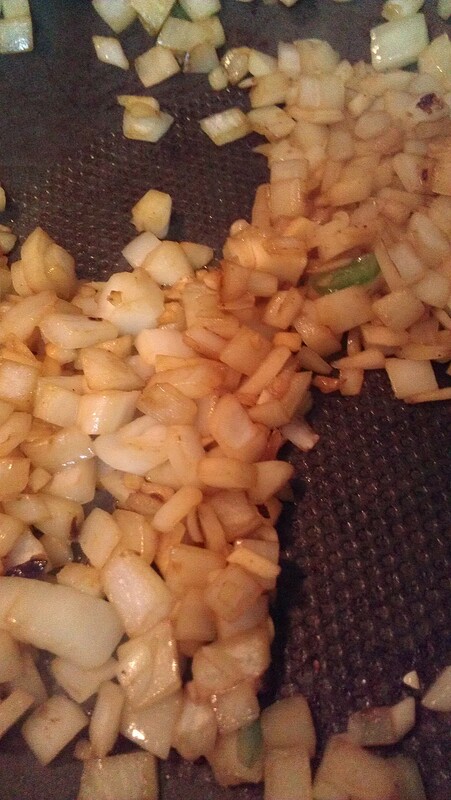 Lower the heat and saute onion and garlic until beginning to turn golden, about 4-5 minutes. 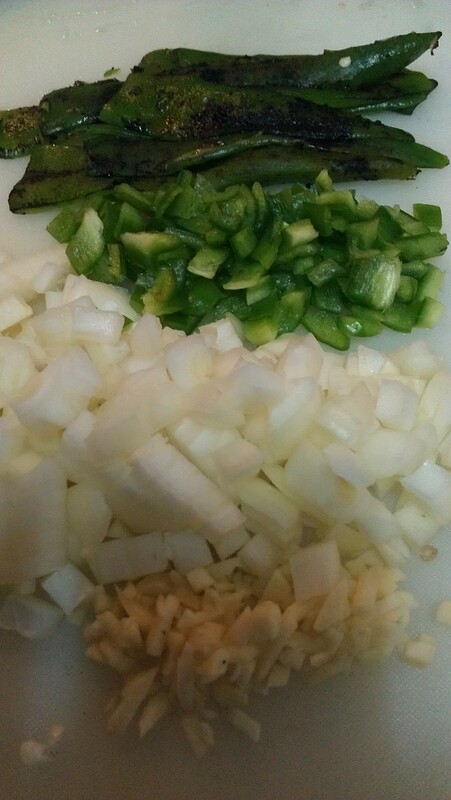 Add bell pepper and diced chiles, saute another 2-3 minutes. 4. Add spices to onion mixture, and stir to mix. Next, return the chicken to the pan and add all remaining ingredients. Allow the mixture to come to a boil, then cover and simmer about 30 minutes or until chicken is cooked through. Remove the chicken, shred, and return to mixture. Simmer uncovered another 5 minutes to allow to thicken. 5. 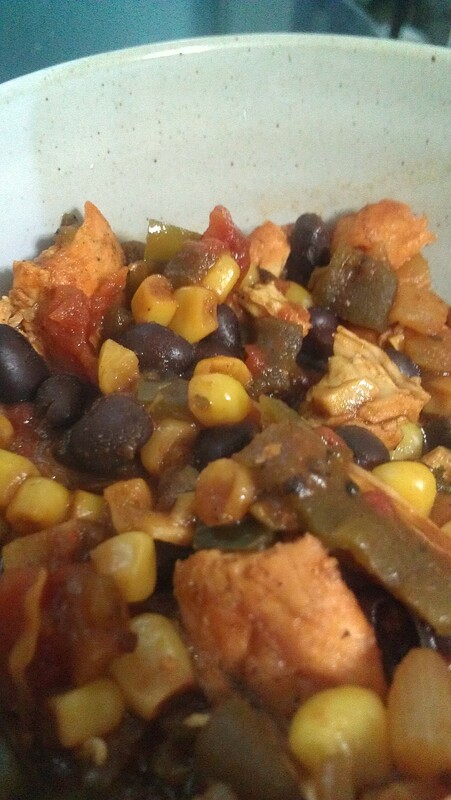 Serve with flour tortillas or nacho chips. Tip: Instead of heating my tortillas in the microwave, I like to throw them on the stove over the open flame for a more authentic flavor. Heat for a few seconds, and when the tortilla begins to bubble, flip and repeat. Serve immediately.